This past Friday, on the 25th anniversary of Black Monday, Bill Gross warned that in the current centrally-planned market "central bank puts" are the modern day equivalent of "portfolio insurance", and he is right. By sending complacency to record levels, and essentially forcing investors to no longer worry, hedge and generally ignore tail risk, the central planners, in their futile attempts to reflate stocks at all costs, are guaranteeing that the market will experience just the type of fat tail event they promise will never occur. As for the catalyst that will make sure of it is none other than our old friend: high frequency trading. Because while central planning is the mechanism by which investing is dragged away from mean reversion, price clearing and fair value discovery, it is HFT that is Bernanke's analogue in the millisecond trading world (as all those who had stop limit orders (that did not get DKed) on May 6, 2010 very well remember). Because when the next Black ___day does happen, it will be due to central planning, but it will be enacted courtesy of HFT (which will never go away until the next and probably final market crash: too much exchange revenue depends on the perpetuation of this parasitic liquidity drain). Which is why it is only appropriate to warn readers that when it comes to system market fragility, at least according to Nanex, whose work ZH first presented nearly two years ago and has since gone mainstream now that HFT is the universal scapegoat of even such legacy media venues as CNBC (it is always better to bash the vacuum tubes than the people who profit, or those who have made a mockery of the stock market - it is not like anything will change anyway), the frequency and magnitude of "wild price spike" events (to put it simply) are now both rising at an exponential rate, and fast approaching Flash Crash levels. Below is a chart showing the daily counts for all NMS stocks of prices that exceeding NxCore filter level 6. Filter levels range from 2 (lowest) to 7 (highest). Stock prices flagged at these levels are almost always canceled or corrected by the exchange later in the trading session. The chart below indicates that wild price spikes are happening with greater frequency and magnitude. The highest peak on the right side of the chart is from the October 9, 2012 "Mini-Knight" event. 1. Daily Count of NMS Stocks with Prices Exceeding NxCore Filter Level 6 Since the Flash Crash. 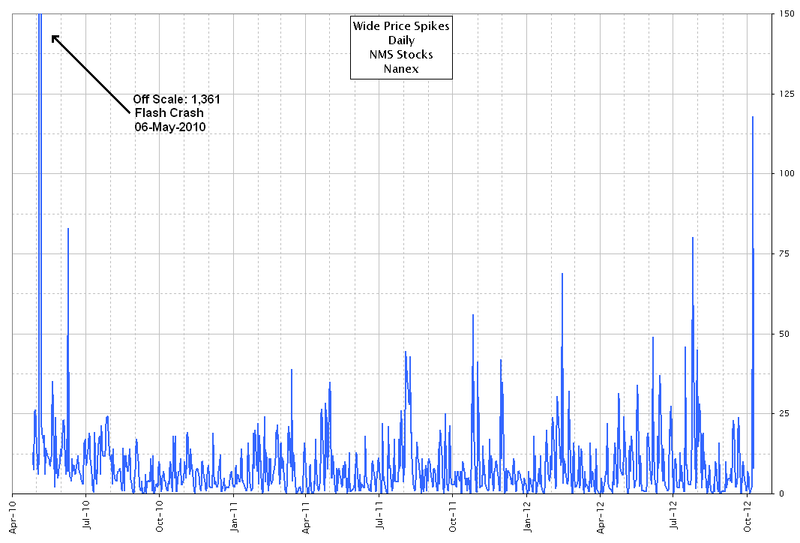 The Flash Crash had 1,361 of these events, which would skew the scale. Remember: with just two months left until the Fiscal Cliff deadline, and Congress not one picometer closer to a compromise resolution, there are just two catalysts which can get the House to cross the aisle and do what is in this nation's interest: i) a "rally behind the flag" war (which is certainly an option), or ii) a massive market crash that wakes everyone from their "the Chairman will get to work and fix everything" stupor and forces the cliff to be resolved or else everyone's political career will be cut short. P.S. for those curious about macroeconomic implications of systemic instability and macro stress tresholds, we urge re-reading ""Trade-Off": A Study In Global Systemic Collapse" - because in today's 'just in time' world, an "equilibrium phase shift" is always just at most minutes away, and no, you cant hedge 'after' the event.